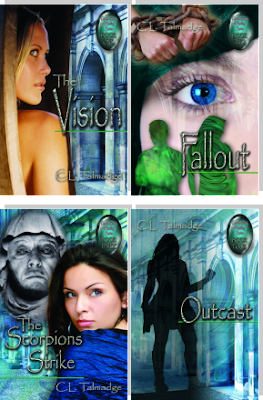 The Green Stone of Healing® speculative epic book set is the full series of four books: The Vision, Fallout, The Scorpions Strike, and Outcast - by the author, C.L. Talmadge. When my husband, Rob, was taken to the hospital by ambulance, I grabbed the first book in this series to take with me, knowing I had long hours ahead of me, sitting, waiting and worrying. It was an excellent choice because Rob slept away a good part of the day, and I needed something to occupy my mind, other than worrying. Immediately, upon reading the first page, I was swept away by the story of Lt. Helen Andros - an illegitimate, presumed orphaned physician with a gift for healing. With a touch of romance, a dose of action and adventure, a dash of paranormal and a whole lot of palace intrigue - the story kept me involved and reading all day long. It's been a very long time since I have read a whole book in just one day. I was surprised at how quickly the day passed, and how the story gripped me and compelled me to keep reading. I have always been attracted to stories of the future, science fiction, fantasy, past lives, reincarnation, spirituality, and healing. This book series certainly fit them all! For a day that could have left me crumbed in tears and fear, with a husband who we first thought was having a heart attack, then a stroke, only to find he had lost his memory and kept asking me the same questions over and over again, every moment he was awake, I was so grateful to have this book to lose myself in. Perhaps the magic of the story even helped me to emotionally and spiritually heal from our scare of possibly losing him? From the book: What happens when politics and piety collide? In the Green Stone of Healing® speculative epic, the conflagration dooms an entire nation and imperils the planet. The saga combines action-adventure, palace intrigue, the paranormal, and undying romance as favorite characters reincarnate and reunite on their spiritual sojourns. Behind the scenes, the otherworldly Mist-Weavers, who know about a mysterious gem's full potential for healing, protection, and destruction, attempt to guide through all manner of perils the four generations of strong-willed women who own the jewel. Sit back. Read. Enjoy the ride. I like to read a bit of everything, I do enjoy historical fiction though. Right now I am really enjoying fiction and autobiographies. Anything to do with history is great. I found this giveaway on the Frugal Freebie website. I follow the Frugal Freebies blog! I love to read almost anything, but first off best-sellers and then horror :) *Thanks* for the giveaway! I found out about this giveaway from visiting the blog :) *Thanks* for the giveaway! I like to read romance or nonfiction. I'm a big Stephen King fan. i like horror novels and suspense. Thanks for the chance. I love to read fiction, historical, and mysteries. I follow frugal freebies through Facebook. I enjoy reading self improvement and fiction for the most part. I found the giveaway on the e-mail update. Thanks. I love reading the children's picture books with humor each night with my son. I will read anything, but my favorite genre is horror & the supernatural. Thanks for the great giveaway! I tend to gravitate towards memoirs and biograhpies. Lately, I've been reading too many political books. Need change. HELP! Thanks! I follow you on twitter: Thanks! I'm a Fan on Facebook. Thanks. I read a lot of different genres, including science fiction, romance and mystery, as well as non-fiction (especially history and cookbooks.) If I had to pick a favorite, it would probably be paranormal romance. I will read almost anything.I love,horror,mystery,sci-fi,historical,true life,fiction,etc.I have not read this set of books.They sound really good. My favorite genre has to be fantasy fiction! I found out about this giveaway on Facebook via CL Talmadge. I like historical fiction. One of my favourites is "The Eagle and the Raven" by Pauline Gedge. It takes place during the time of the Roman invasion of Britain. Wonderful writing! I almost missed my subway stop many times while reading this book on the way to work. I love to read all kinds of books but really enjoy fantasy, science fiction, horror books when it comes to just relaxing and getting out of my head. I love to read!! I typically pick a fantasy novel ~ scifi, dungeons & dragons, vampire... but typically with a hint of romance. I also like the chick lit books published by Red Dress Ink, for a little lighter reading. Thanks!!! I found this contest in the "Giveaway Gathering" on Deal Seeking Mom's site. Right now I am into reading mysteries. So much so that I find something missing if I read a regular novel. That will probably change soon as I tend to go in cycles. I love to read many different topics, but particularly love politics and legal thrillers. I love to read science fantasy or historical fiction. I sure do love a good book! I came here via deal seeking mom's giveaway gathering! I would probably have to say fiction, maybe a biography of someone i was really interested in. I love Mysteries wih a female Private Eye! Thanks for the chance to win a Prize! I like non-fiction best, actually. I like a good who-done-it. I hope your husband is okay-I am going to look through your other posts to catch up. I follow on Google Blogger. I will read anything, but my love is supernatural & horror books. Thanks for the giveaway. Thanks for the chance to win! I like to read both ficiton and non-fiction books. Specifically, I like to read mysteries and books about historical figures. I read just about anything but science fiction. If I had to pick one category I think it would be suspense. I found this giveaway on Online Sweepstakes. I follow you on Twitter as njhhb. I like to read all kinds of books. I like nonfiction, social issue kind of books, but I like fun fiction mysteries, romances, etc. I love it all. I found out about this from Tip-Junkie. I read EVERYTHING, am always looking for a new author to try! Medical mystery and fantasy are my favorite types of books. I love YA novels like the Hunger Games. I love to read adventure but I will read anything. My fav book type would be romance or intrigue. My favorite book type would be adventure and historical. My favorite reads are a variety...intrigue, horror, sci fi, spiritual, historical...anything I find interesting. My favorite type of stories are fantasy and supernatural. I follow Frugal Freebies on Twitter. I stole your button, its on my sidebar. I follow through Networked Blogs. Romance, intrigue, sci-fi are all great fun to read. I like adventure and historical reading. I found you through Sweeps Advantage. Thanks! My favorite genre is cozy mystery. I love scifi fantasy and especially romances with a touch of scifi. I love fantasy best! My favorites are telepathy and pairing with an animal(like being Chosen in Mercedes Lackey's Valdemar novels). I found you on Prizey! I subscribe to the blog using Google Reader! I LOVE SUPERNATURAL, TIME TRAVEL & ROMANCE! IF I FIND A BOOK THAT HAS ALL 3 IT'S A TRIFECTA! I FOUND THIS ON OLS & READ ABOUT IT IN NEWSLETTER! FOLLOW ON GOOGLE FRIENDS CONNECT BLOGGER! I like to read thrillers best because they have more of a tendency to grab my attention and hold it.